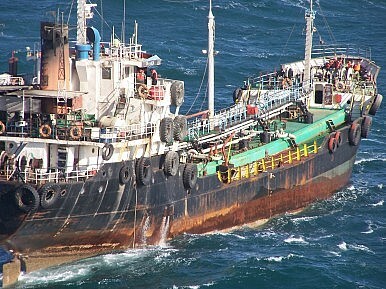 A North Korean oil tanker which docked at Libya’s Es Sider port and loaded $36 million in crude has been intercepted. Over the weekend, reports emerged that a North Korea-flagged oil tanker was in the Mediterranean, docked at Libya’s Es Sider terminal – one of the country’s largest oil exporting ports and under control by anti-government Libyan rebels since August 2013. The vessel, the Morning Glory, was registered under Saudi Arbia but sailed under the North Korean flag. The incident was puzzling for several reasons: Why was a North Korea-flagged ship in the Mediterranean? Is the North Korean regime formally cooperating with Libya’s federalist rebels? Is there a quid pro quo arrangement here – did the rebels expect to gain North Korean favor in addition to cash for the oil? The Libyan government’s reaction to the ship docking at Es Sider was less than sanguine. “Any attempt (by the tanker) to move, it will be turned into scrap,” Libyan Culture Minister Al-Habib al-Amin told the Associated Press. The Prime Minister, Ali Zeidan, confirmed that Libya would bomb the vessel should it try to leave Es Sider port. The government regards the North Korean tanker’s purchase of oil as illegal and essentially amounting to the theft of national resources as the rebels have no legal right to sell Libyan oil in their view. The latest reports indicate that the Morning Glory sailed out of Es Sider with $36 million in crude oil en route to international waters but was intercepted by Libyan vessels after an exchange of fire. Spokesperson for the General National Congress (GNC) Omar Hemidan confirmed that the tanker was being escorted to Misrata port with conflicting reports that it might be en route to Zawia to unload the oil there. Shedding light on the situation, Cheong Seong-chang, a South Korean analyst interviewed by the Wall Street Journal, noted that it is likely that the ship is actually a North Korean vessel. “The rebels may have suggested the sale of crude oil at one third or one fourth of market prices in return for shipping it out of the insecure area. Few Western oil shipping companies would’ve taken the risky job,” he notes. For North Korea, risky deals on oil might appear appealing – it is likely that the asking rate at Es Sider was a fraction of actual market prices. Libya has noted that state prosecutors would treat the tanker’s activities as smuggling.